When people meet in groups they begin to think and feel differently, whatever the purpose of the gathering. In our second blog we talked about how our own ideas are being challenged and enriched as we design the Facilitation Anywhere training course. This process is amplified in groups. We think about and change our ideas – whether about each other, the specific work context or program, the subjects being discussed, or even ideas or subjects entirely unrelated to the workshop but in the forefront of our minds. In the collective learning that happens in groups (often referred to as social learning), people recognise shared beliefs and what they have in common, begin to shape new concepts, identify their differences and come together around what they can agree on. Making sense of what’s emerging is probably the most complex part of a workshop or event, for both facilitator and participants. The facilitator needs to notice and reflect on what’s happening and, in consultation with the organisers, share this with the group to help trigger further conversation. Facilitators play a central role at this stage, not because we’re driving the event, but because it’s one of the key moments when, as the person ‘holding the space’, we have the potential to add most value. Practically speaking, this isn’t something you can do on the first morning. After surfacing ‘what we know’, now’s the time to start to sense into what’s emerging, give people space to reflect and see what insights, patterns and themes are taking shape. It’s necessarily messy, often chaotic, frequently uncomfortable and can also be exciting! As facilitators we have to call on all our internal resources to be in tune with the group, stay centred, listen and adapt to what’s arising. Let go of the choreography and improvise! OBJECTIVE Facts e.g. What can you see? REFLECTIVE Reaction e.g. Where have you seen something like this before? INTERPRETIVE Implications e.g. What does this mean to you? DECISIONAL Actions e.g. How might this principle be used? This blog from ace facilitator Martin Gilbraith is a good introduction. And here’s a story of how ORID was used in a workshop in Hanoi to encourage and support reflective processes. Insight s and shifts happen when people are listening together and are open to what’s arising. Conversation cafe, world cafe (left) and fishbowl create spaces for this kind of sharing and enquiry into emerging questions. 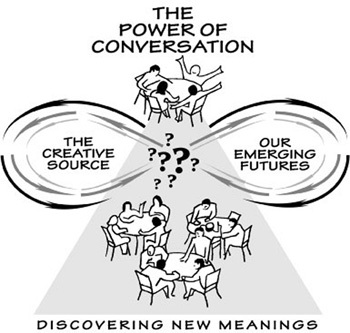 Have a look at the Art of Hosting for ideas for convening and hosting emergent learning. All three methods are also reviewed in the KS Toolkit, and the great Liberating Structures folks have their own variants. multi-channel room + presentation + text + audio/video participation The high-end option – if you can’t deliver effective, blended meetings with this level of resources, then you need a training programme! A good, general introduction to the issues is provided in, ‘20 Tips for Facilitating Virtual and Blended Meetings’ from Grove.com.